Do you remember your first day of work? I’ve had several jobs since I was sixteen: Tall Flag instructor, retail clothes salesperson/cashier, restaurant hostess, Pocahontas (true story), high school Spanish teacher, and now assistant tour guide. I have vivid memories of my first day at Disneyland and my first day at Carlsbad High School, and I know that today – my first day as an assistant tour guide in Europe – will be just as memorable. My first duty: greet our tour members and provide them with a welcome refreshment. I tried to memorize their names as I met them, but by the time I got to the ninth person, all their names were like Scrabble pieces tumbling in my brain. Thankfully, I had a roster where I could take notes as they introduced themselves to the entire group: interests, reason for taking this particular tour, where they’re from, or what languages they know. But even with that, it’ll take me at least 48 hours before I have everyone’s name committed to memory. 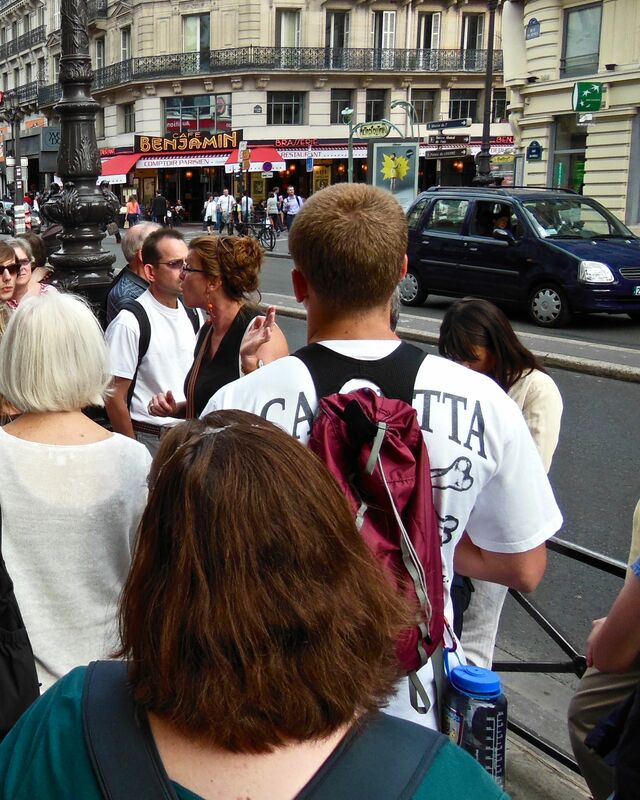 Julie guides us on an orientation walk through our Parisian neighborhood. After our introductory meeting, Julie (the lead guide) took us on a walking tour of the neighborhood, pointing out the local pharmacie/ banque/boulangerie/fruitier/laverie and giving us historical and cultural lessons about the neighborhood church, the pedestrian-only market street – my preferred one in Paris and immortalized by Claude Monet– Rue Montorgueil and the Châtelet metro station. 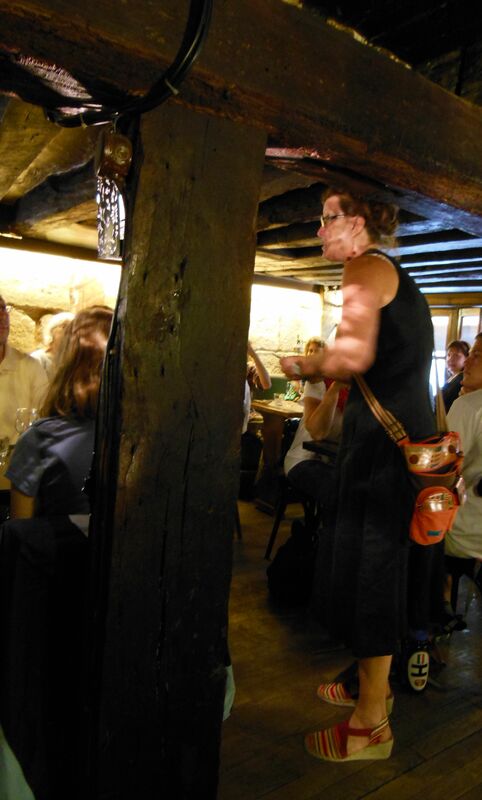 Despite being very familiar with this area of Paris (having lived here last summer just a few blocks away from our current hotel) I learned some new things from the wealth of knowledge that Julie shared with us. There’s a lot that an assistant needs to pay attention to – not just the information the lead is sharing, but also the tenor of the group, making sure no one dawdles or gets lost, the physical surroundings, and the questions that come flying your way about what we’re doing, where we’re going or when we need to be somewhere. I’m so grateful that I got to start in a city that I know well. Watch your head at L’Auberge Café. At the end of the walking tour, we headed to dinner at L’Auberge Café. It’s housed in a half-timbered building that dates back to around the time of King Henri IV (late 16th/early 17th century for those who prefer a time reference). Because of the size of our group (28) and the size of the restaurant (not big), we ate on the top floor where the ceiling was only about five inches higher than the top of my head. For me – being only 5’1” – that’s not really a problem. Now imagine everyone else in my group, many are at least 5’9” and the tallest being 6’4”, having to duck down in order to enter and shoehorn themselves into this room. Fortunately they were forewarned so we didn’t end up with anyone with goose-egged head. The owner claimed that that the height of the ceilings doesn’t matter because once we sit down, we’re all the same height. Restored (the word restaurant comes from the verb restaurer) by our first meal together of traditional French food – I had foie gras, saumon au beurre et pommes purées, and a trio of mini desserts – many of us retired to the terrace for our after dinner coffee and conversation. While the breaking of the ice is a bit slow going at the start of a tour, I did get to know several of the teachers on the tour (surprisingly there are five tour members in the education field). Jeanne, a former high school teacher and reading specialist mentor-turned-administrator, was especially friendly and easy to talk to. We talked about our backgrounds in education, how our roles have evolved and the twists and turns that life sometimes throws at you. 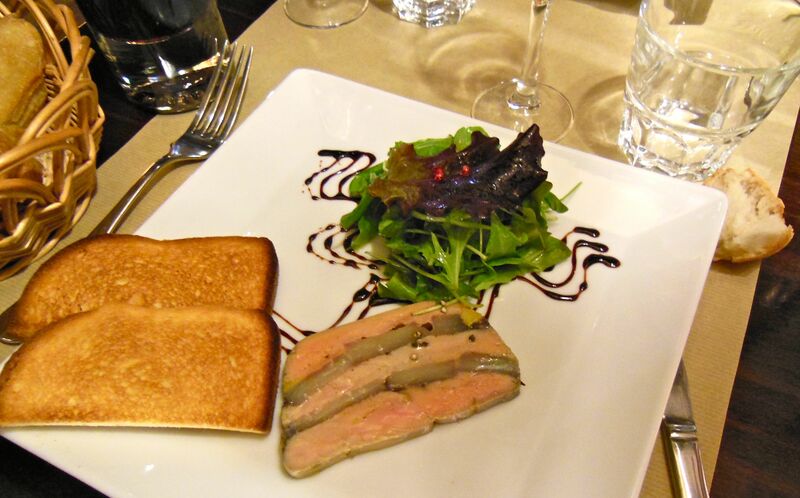 Pour l’entrée (starter), je prends du foie gras, s’il vous plait. Two sentences from a veritable stranger relieved me of this guilt that’s been weighing down my heart for so long and helped me to embrace with pride this path that I’ve chosen for myself. Perhaps that’s part of the wonder and power of travel. When you allow yourself to be open and let serendipity lead you to new experiences and new interactions, something (or someone) can move you and even change the way you look at things. Today, my first day of work, I learned more about Paris, but most importantly, I learned more about myself. Teaching runs in your blood; Grandma & Grandpa were teachers, so was I; and Dad is sharing his music by directing!!! Jeanne is so right, you are still a Teacher!!!! LOVE!!! LOVE!!! LOVE!!! I’m so grateful for the support you and Dad always give me. It means so much, Mom. Thank you. Everything happens for a reason and works out the way its supposed to:) So proud of your choice and love to know all about your new adventure! This also means so much to me to have your support. Thanks for always being on my side and supporting me.